The issue of class sizes has been part of a wider debate on education for a long time now. While changing class sizes cannot possibly solve all the problems with our education system, and while it should not distract us from other problems entrenched within the system, it is an issue which ought to be more critically examined. In his view, one of the sacred cows that should remain is the status quo on class sizes, reiterating the Ministry’s position that reducing class sizes is not a viable solution. The Workers’ Party has been calling attention to the idea of reducing class sizes in Singapore for a long time now. In 1992 and 1995, then MP for Hougang, Low Thia Khiang asked the Government to consider reducing class sizes. Back then, a recurring point raised by the Government was that overseas studies on the influence of reducing class sizes had yielded inconclusive results. Almost two decades later, the WP continued to push the Government to consider reducing class sizes. Whilst acknowledging that “class size reduction is not the magic bullet to better student development,” former NCMP Yee Jenn Jong reiterated the call to reduce class size in 2013 and 2014, arguing that the time had been ripe for MOE to plan for smaller class sizes, given our slowing birth rates. In 2016 and 2017, respectively, NCMPs Daniel Goh and Leon Perera raised similar calls based on the manifesto they had run on in GE2015. Our stance was clear: While the hiring of quality teachers should continue, class sizes should be reduced to not more than 30 students per class in primary and secondary schools, with the eventual goal of reducing class sizes to 20 students, which will be in line with the OECD average. The premise underlying this stance was that quality teachers would be able to give more attention to each student, especially weaker students, and would more effectively cultivate critical and creative thinking, as well as communication skills in the classroom. Highlighting the benefits to students’ academic achievements, the development of soft skills, and reducing parents’ dependence on private tuition, on 7 November 2017, NCMP Leon Perera filed an Adjournment Motion in Parliament where he called for smaller form class sizes in primary and secondary schools. After more than two decades, the Government’s argument continued to rest, in part, on the point about the inconclusive results of overseas studies on class size. However, it is noteworthy that MOE had reduced average class sizes before, from 40 to 30 students per class for Primary 1 in 2005 and Primary 2 in 2006. In Parliament in 2007, the outcome of this change was also described by the Government as generally positive. In the ongoing debate on class size, another often cited point raised by the Government has been that the quality of teachers as a factor should not be overlooked. During a recent Parliamentary debate on education on 11 July 2018, Minister Ong Ye Kung referred to the 2011 study by the Center for American Progress to highlight how reducing class sizes may affect the quality of teachers. “(In) the US’ context, smaller class sizes meant hiring of many new teachers, who were inexperienced and yet to be effective in the classroom,” he explained. However, the pressure induced by the need to hire more teachers would be partially alleviated by our falling Total Fertility Rate (TFR). 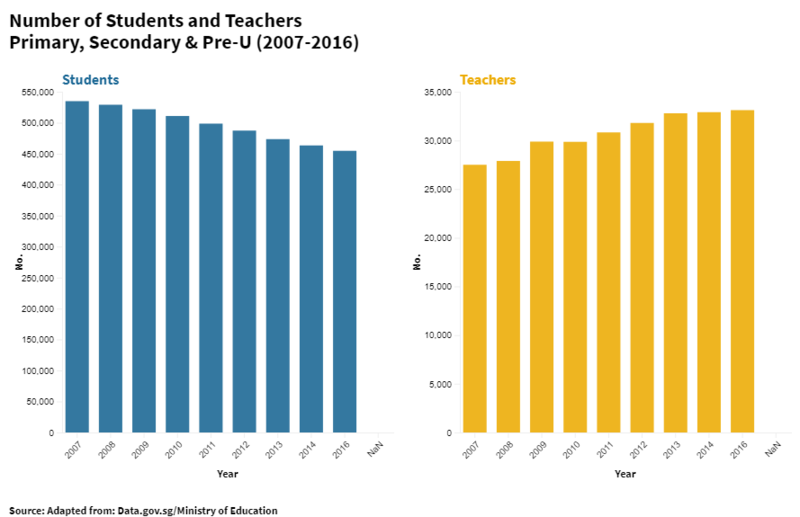 Indeed, according to a Straits Times article published in November 2017, the size of the teaching force had grown by roughly 20% between 2007 and 2017 and, since five years ago, has stabilised at more than 33,000 teachers. Moreover, the number of students entering Secondary 1 has fallen by over 20% during the decade from 2006 to 2016. With a lower Total Fertility Rate and a stabilising number of teachers, the pressure induced by having to hire more teachers, should class sizes be reduced, would be partially alleviated. Some may argue that over the longer term, even after reducing class sizes, a falling TFR will eventually result in a decrease in the size of the teaching force too. However, so long as this rate of decrease does not outpace the rate of decrease in the number of students entering each new cohort, MOE will be able to maintain suitable teacher to student ratios under a scenario where class sizes have been reduced. Even then, if Minister Ong’s concern about the US example was that the hiring of new teachers occurred too quickly such that it resulted in a sudden increase in the number of inexperienced teachers, the speed at which we make the transition to smaller class sizes in Singapore could be fine-tuned by MOE to prevent this problem from arising. This gradual shift will allow future cohorts of Singaporean students to benefit from smaller class sizes. Clearly, reducing class sizes will alleviate some of the pressure on teachers who will have more time to attend to each student during school hours. Teachers will also benefit from a reduction in class sizes as they would no longer need to spend as much time during after-work hours helping students, planning lessons, and marking as they do now. It would follow that such a change in class size would not reduce the quality of teaching or of teachers. On the contrary, the quality of teaching would improve. Minister Ong also shared that teachers in Finland prefer to have the flexibility to configure class sizes for different groups of students, which is what Singapore has also been doing. While it is true that class size today varies according to the subject and specific needs of students, smaller class sizes are usually available to either the highest-achieving or those who need the most help. For instance, students in the Gifted Education Programme (GEP) can expect class sizes of about 20. Similarly, class sizes stand at about 20 in Crest Secondary School, Spectra Secondary School, NorthLight School and Assumption Pathway School. It is encouraging that the Government has taken steps to meet the needs of students of varying abilities. At the same time, there remains a significant number of students in the middle, in larger classes who also deserve to receive the best possible support and opportunity to excel. Indeed, these students may represent a bulk of the tuition industry’s demands. After all, tuition centres often use “smaller class sizes” to attract parents to sign their children up. Moreover, it is crucial that our education system better serves students who find themselves lagging behind their peers academically, in the vast majority of schools which do not currently benefit from smaller class sizes. Smaller class sizes may reduce the need for students to seek extra help outside of regular curriculum hours through supplementary or remedial lessons. This will free up more time for co-curricular and leisure activities for students, and can also reduce teachers’ workload. While we should not blindly slaughter sacred cows, we should not shy away from making the bold changes our education system needs in order to enable students to maximise their potential. Through a more critical lens, it is not impossible to deduce that reducing class sizes, if done in the right manner, can be a pragmatic way to make the education system fairer for students in Singapore. Reducing class sizes is by no means a panacea for the problems our education system has failed to address. However, it represents a commitment that our generation of Singaporeans can make today to improve our education system for generations of Singaporeans yet to come.